TCS Concentrated Denture Cleaner safely, quickly and effectively maintains the cleanliness of all dentures and dental appliances. 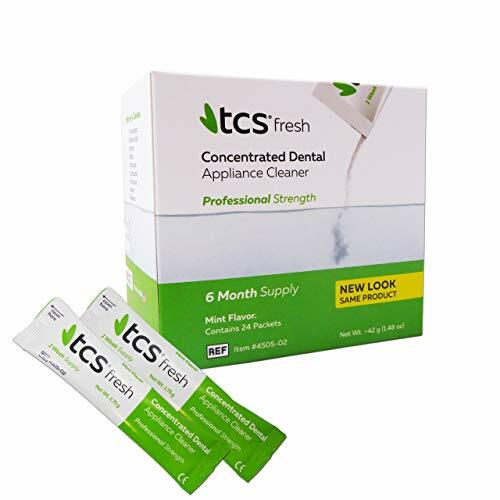 One box of TCS Cleaner is designed to last up to six months making it an economical solution to conventional denture cleaners. It is a non-abrasive cleaner specifically designed for the hygienic cleaning and maintenance of TCS appliances and all others. TCS Cleaner is supplied in boxes of 24 sachets, each sachet will make one week's supply of solution. One sachet is mixed with a cup of warm water - this solution will last for 7 days before needing to be replaced. A daily 15 minute soaking has proven to be effective in maintaining the appearance and cleanliness of dental appliances. Overnight soaking in TCS Cleaner solution will not harm your appliance.